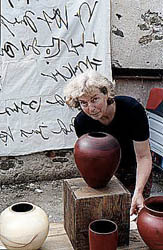 Technique: earthenware, engobe, polishing or glaze. Production: thrown shapes, plates, modelling, wood and clay, clay and metal miscellany. I try to do a more and more personal work that would be an image of my life, my efforts, my experience. I would like that my pots bring joy, surpassing. They would give encouragement to everyone to grow - a wide open window to the world. My work is just like a present that i would like to share. I use eartenware that i paint and polish with stones. I am located in the citycenter of Chambéry (Savoie, France), it's a city workshop, open to the street, visitors can see me working in the place contiguous to the showroom.